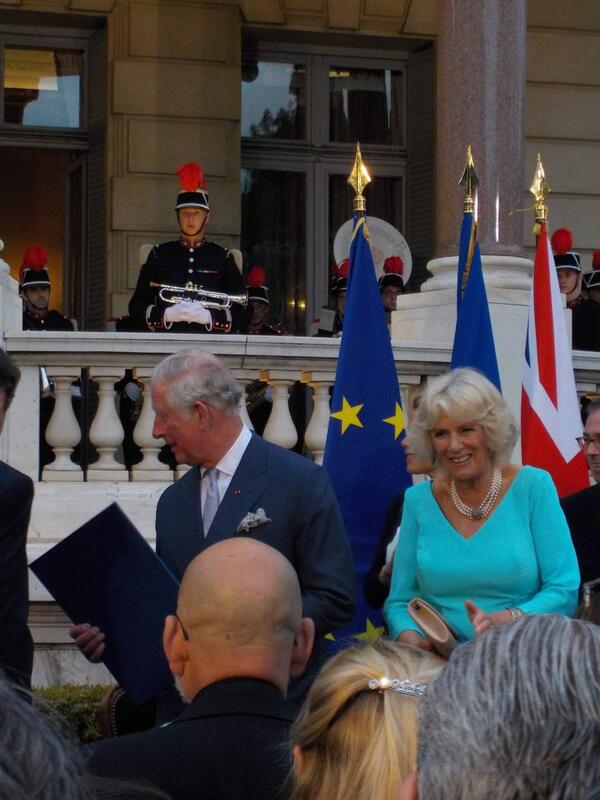 It isn’t every day that we are contacted by the British Embassy in Paris with an invitation to attend a reception to be hosted by The Prince of Wales and the Duchess of Cornwall……and that was only the start of the story. We accepted the invitation of course and on 7th May National President Penny, Angela Anderson, President of CS06 Alpes Maritimes and yours truly as Vice President, presented ourselves at 17h30 at the security access to Villa Massena. We had been told we were to be presented to the Duchess and were placed in our group (charities and education) on the manicured lawn….and we waited…. …and waited…for two hours. It was a hot evening, there were no seats or refreshments and why was I wearing three inch heels bought that morning? But it was absolutely worth it. Their royal hignesses arrived and then separated to work their way along the lines of guests assembled along each side of the lawn. We were indeed presented to the Duchess who could not have been more natural or friendly or interested. We had a brief opportunity to tell her about CSF before she moved on to the next group, but then managed a longer conversation with her private secretary. Previously in the day the royal couple had met survivors of the Nice terror attack last year and had laid flowers at the memorial. They had two other engagements before they arrived at the reception, so I have great respect for the energy and enthusiasm the Duchess demonstrated at the end of a long day. I bet her feet hurt just like mine! After the presentations the mayor of Nice spoke of the gratitude of the people of Nice for the support offered by the royal family after the terror attack and during his speech he made the Prince of Wales a citizen of Nice. I sometimes wonder what is gained from attending such events, is there a cost benefit? I can definitely say yes on this occasion. To be recognised by the British Embassy for inclusion is a great step forward in our relationship with not only the Embassy itself but other organisations connected to it. During our two hour wait there was the opportunity to speak to so many folks who knew nothing of CSF and with luck the local and national associations will benefit from raised awareness. We also met local groups who were successful fundraisers (there’s a lot of money on that stretch of coast) and again we are hopeful we will benefit from these new links. Now all I have to do is rescue the heels of my new shoes.